In 2014 TAGD launched a “GCD 101” training initiative. 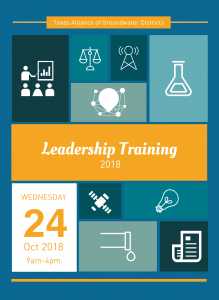 Our Leadership Training course is designed for GCD board members and new general managers or staff members who would benefit from a comprehensive overview of local government laws, groundwater science and policy, and other matters related to groundwater management. The one day course includes a review of four fundamental sectors in groundwater management: GCD governance, groundwater science, groundwater case law, and state agencies and legislation. TAGD hosted a Leadership Training October 24, 2018 in Austin. The training was a full-day event with sessions including Groundwater 101, Case Law, Joint Planning, Communications Training and a GCD Operations Workshop. View the agenda for the training here. The Texas Alliance of Groundwater Districts will host 5 Mobile Leadership Trainings this fall across the state. Each event will be tailored to issues in its region include a full day of specialized training sessions for GCD board members and staff. Evening sessions will invite the public and local legislators to join you for dinner and panel discussions. Check back here for a schedule of events, detailed agendas, speaker announcements and registration. TAGD will also hold stakeholder meetings at each location on the day following the leadership training to discuss groundwater data collection. More information on these events soon. Our first-ever Leadership Training was a huge success! It was held in Lubbock, Texas in partnership with High Plains Underground Water Conservation District No. 1 (HPWD). The two-day training course was held at the Bayer Museum of Agriculture, September 16-17, 2014. We had an excellent networking dinner at Cagle’s Steakhouse on Tuesday evening with a presentation by Representative Lyle Larson. Our training speakers included TWDB Board Member Bech Bruun, hydrogeologists, attorneys, and public relations experts. Thank you to our Leadership Training Sponsors!